Mr. Prasanna Hegde is an accomplished speech language pathologist from Bangalore. He holds a bachelor?s degree in Bachelor of Speech Language Pathology (BASLP) from Dr. S.R.C. Institute of Speech and Hearing 2010. He completed his Master of Speech Language Pathology (MASLP) from All India Institute of speech and hearing in 2012. His areas of specializations are Speech Therapy and Audiology in which he has a lot of experience. He was the Speech Pathologist and Audiologist at Manipal Hospital and Indira Gandhi Medical College and Hospital from 2012-2013. Currently he is working as a visiting Speech-language Pathologist at RECOUP and Bangalore Neuro Centre. He also provides his expertise and consultancy services at Apollo Hospital in Bangalore. 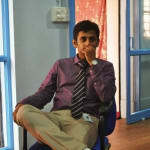 He is also the founder and director of INSIGHT Bangalore. He is also working in NewRO as a member of Neuro Rehabilitation team. His other areas of specialization includes-Voice Articulation, Fluency Disorder, Laryngectomy and Rehabilitation of Paediatric Speech. He is also a member of Indian Federation of Neurorehabilitation.